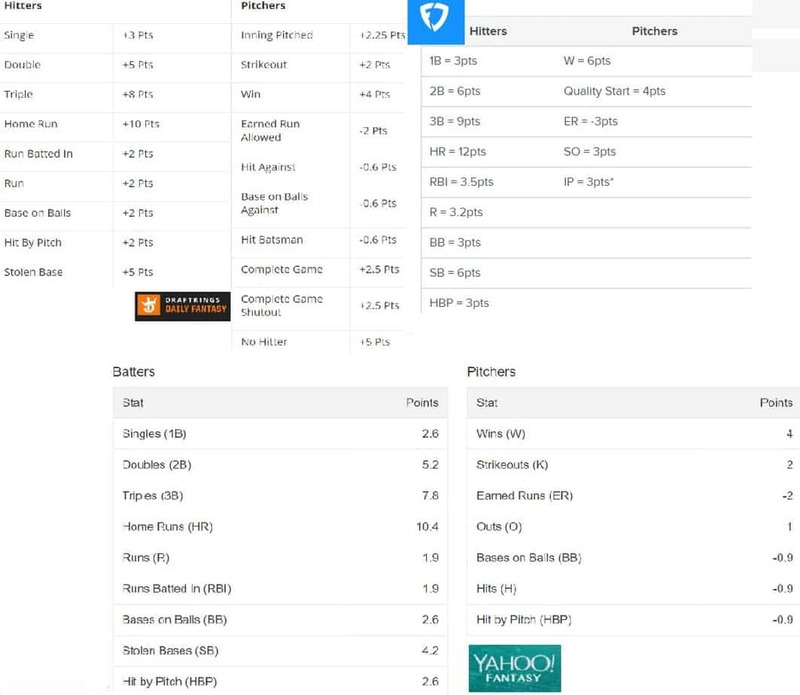 Awesemo.com’s premium subscription to MLB includes Awesemo’s rankings and ownership projections through the World Series, the Awesemo.com projections and lineup builder, and premium articles: the Deeper Dive and Awesemo’s articles (May-September): Pitchers, Stacks, and Roster Construction breakdowns. Sign up for our MLB or All-Access annual package before March 26th and get $50 off using the promo code MLBEarlyBird. Summer is almost here and that means fantasy baseball, and a lot of it! Although the NBA and NHL are winding down, baseball makes up for their absence by packing 162 games into a season—almost twice as many games as basketball and hockey. Baseball is also one of my favorite DFS sports, both in terms of enjoyability and profitability. As the least predictable of the major sports, it’s the perfect testing ground for advanced DFS strategies. While accurate projections are critical to success in a sport like NBA, where LeBron James will score between 20 and 35 points the vast majority of the time, even the best MLB projections won’t help you determine with any confidence whether Bryce Harper will go 0 for 4 or hit two home runs. As a result, lineups built with less than perfect fantasy points projections can be competitive. The key to success in baseball is ensuring you have adequate correlation in your GPP lineups and sifting through large amounts of data, including ownership projections, rankings, lineups, and weather. I’ve found that simply playing the highest projected lineup in GPPs is not a profitable in the long run, regardless of the quality of projections. Instead you’ll want to focus on forcing players who are correlated into your lineup rather than focusing on projection alone. The primary correlation is between batters on the same team, whose positive correlation stem from a variety of factors. First, the number of at bats in a game varies, so each successful at bat creates another opportunity to get fantasy points. Second, batters have the potential for extra points with runners in scoring position. Third, pitchers shorten their delivery with runners on base leading to less effective pitching. And finally, once the game gets out of hand, teams will play guys from the back end of their bullpen rotation rather than wasting innings from their best relievers on a game that’s already been lost. For a stack to work, there needs to be a team (or multiple teams) that night with an outlier performance. Since that is more likely to happen on a large slate, you should stack your players together more when there are more games to choose from. The best way to choose a stack is to focus on a team’s implied total based on sportsbook over/unders and the team’s chance of winning. I calculate implied totals and update them throughout the day on my MLB Rankings page. The most popular strategy is to stack at least one team, but usually two with the maximum number of players allowed in each (DraftKings allows five-player stacks and FanDuel, four-player stacks). If you fully stack your lineup and pick ones with reasonable projections, you can be certain that you’ll have a great shot to win at the largest field tournaments. There is a drawback to stacking too much though; you can increase the overall projection of your lineup if you sub out an overpriced player in a stack for an optimal play, say, Mike Trout for example. Also, you may eliminate some possibilities that could be strong. Suppose two teams are playing at Coors Field but neither has a player listed as a shortstop in the lineup that day. Then if you set FantasyCruncher to have two full stacks, you will not end up with any of this potentially favorable combination in your lineup. A popular strategy since 2018 is to multiply the projections of your batters by a constant before building rosters to create lineups that spend a higher percentage of your salary cap on batters. The theory is that higher priced batters have a higher volatility compared to budgets bats then high priced pitchers to budget ones. For a batter to be exceptionally volatile, he needs to have power or base stealing potential. On the other hand, pitchers are all extremely volatile. I think there’s something to this because a lot of times a team might be overpriced but still projected to do very well on a given day, and they will be overlooked by people who just optimize by median projections. If the chance that they will be the best stack of the day exceeds their ownership they are usually a good play regardless of the lack of value. Baseball has the most stat-obsessed sports culture out of any sport I’ve studied. There are so many resources and advanced stats to choose from that you could easily get overwhelmed by diving too deep into that world. You’d be wise to focus on a just few stats to start. For batters my favorites include OBP (on base %) and ISO (isolated power %), which will help you determine a player’s production at the plate. For pitchers, I’ve found that strikeout % and WHIP (walks+hits divided by innings pitched) have the strongest relationship to fantasy performance. Because there’s so much variance it’s also important to determine what impact luck may have had on these stats. BABIP for batters and xFIP for pitchers can help you determine what a player’s stats should be versus what they currently are. After settling on what stats to incorporate you’ll want to consider the players matchup, park factors, weather and lineup order. For matchups, you’ll want to pay attention to the handedness of both pitchers and batters. Batters have an advantage versus pitchers using the opposite hand, and pitchers have the advantage versus batters of the same hand. Teams will frequently use different lineups versus left-handed pitchers than right-handed pitchers to maximize their production. You should prefer batters with a favorable matchup in this respect; however, it’s not as simple as just looking at their stats versus that pitcher type, because starters typically only pitcher 5-6 innings. Some teams also employ “platoons” which use two players from the opposite side of the plate at the same position. You should watch out for players who meet this description because they are frequently subbed out versus relief pitchers, which makes their production not as good as it might seem at first glance. Park factors are important as well as anyone who has ever watched a Rockies home game can attest to. The main external factor affecting batter performance is air density. When the air is dense, there is more resistance on the ball and it doesn’t travel as far. When it’s not, players are able to generate more hits and more power. The main factors contributing to air density are temperature and elevation. Both make the air less dense as they are higher. That’s why Coors Field in the “Mile High City” is such a great batter’s park. I didn’t have as much luck when I tried the batting cages there though, so it’s not going to make just anyone into the next Barry Bonds. While you’re checking the air temperature make sure to pay attention to reports of precipitation as well. There are several great resources to help you determine the chance of a game’s postponement, but I use radar to make my final decision. If a game looks like it might have more than a couple hours of rain, then it’s important to discount your player projections to reflect that. From reports in postponed games this year, it appears that the system for postponing games has changed over the past year due to abuse by a certain team which may be based in the country’s capital. Now that the MLB is making the final decisions instead of the home teams, I’m not as worried now about teams notorious for postponing games they just didn’t want to play. Check my rankings for my estimated chance of a game being postponed. The final factor to consider in your projections are lineups. Several hours before game time, each team releases their batting order, which tells you exactly who is going to be playing in the game. But lineups aren’t just helpful for determining who is playing, but also how many opportunities they will have. Much like minutes in the NBA, at-bats are critical to accurate baseball projections. Once you know someone’s position in the batting order, at-bats are a lot more predictable than minutes in the NBA, which can be heavily influenced from game to game by coaching decisions. 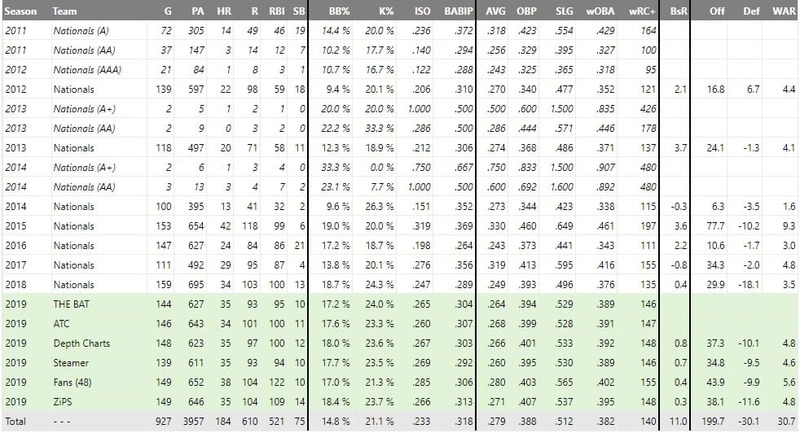 If the idea of developing projections still seems overwhelming, I’d recommend using my MLB Rankings(which are derived from the projections I use myself) and our site projections to build your lineups. You’ll want to focus on getting as many high value players as possible in your lineup, while spending all of your salary. Because the rankings are based on my projections all of these factors are already taken into consideration, including weather with grades being adjusted based on the chances of a postponement. While most sports have similar strategy between fantasy sites, the baseball scoring systems require different strategies to be successful. On DraftKings and Yahoo!, the value of stacking isn’t as high as FanDuel because RBI’s and runs are relatively less valuable compared to bases. The marginal value of each additional base is higher on FanDuel because each additional hit with base runners tends to correspond with a run scored. High scoring performances tend to have a larger proportion of their fantasy points from runs/RBIs than low scoring teams. This all means batter correlations on FanDuel are significantly more valuable, and you can weight them more heavily than projection and ownership compared to DraftKings and Yahoo!. FanDuel’s quality start bonus creates an incentive to pick pitchers who throw more pitches. To earn a quality start, a pitcher must complete six innings. With a league average WHIP (Walks+Hits per inning pitched) of around 1.3, six innings on average takes about 26 pitchers. Very few pitchers average that much volume, and the odds of a quality start drop precipitously when a pitcher averages only 80-90 pitches compared to 100. Additionally, giving up bases isn’t penalized, only run scoring. 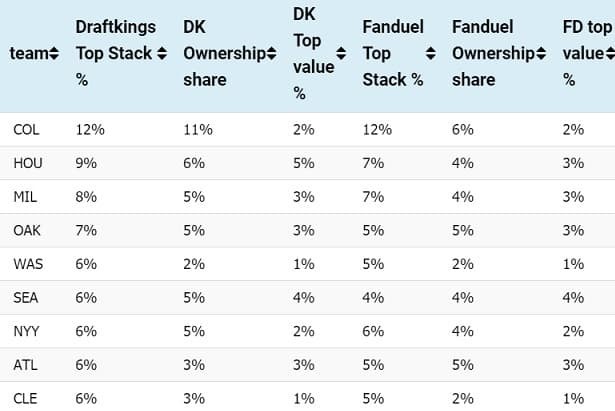 This all means that pitchers who go deep in games are relatively more valuable on FanDuel than DraftKings and Yahoo. On DK and Yahoo, you can rely more on the volatility of how many base runners a pitcher gives up to give you the upside you need to win a GPP. Since baseball is the most volatile of any major sport, on any given night, the edge the top player at any position has versus other good players at the position is small. To illustrate this, I break down pitchers’ probability of being the top performer semi-weekly in my Perfect Pitcher article. Accordingly there is significant opportunity to be contrarian as ownership tends to cluster on the best plays of the night. To get a gauge on ownership, I’d recommend you review my ownership projections each night and avoid those pitchers and batters that are likely to go over/under-owned. But exercise caution when going contrarian. It’s kind of like the behind-the-back pass in basketball–it’s the optimal play in a limited number of situations but it’s tempting to overuse it. The focus should always be on maximizing score and correlation, while avoiding overly chalky lineups. You don’t get style points for having a roster filled with 1% owned guys. Strategy is always important in fantasy sports, but it’s especially important in fantasy MLB. In today’s games, most of the good players have similar projections and know who the best picks are on any given day. To beat the field, you need to go to the next level, which is figuring out picks that people aren’t taking as much that have a great chance for success. Combining the Awesemo.com articles, rankings, and ownership projections will help you find those sleeper plays and give you the best chance of success every night. As with most sports you should figure out some way with each of your lineups to be differentiated from the field. What works the best is pairing popular plays with a couple of sleepers. So if you’re going with a highly-owned stack, you should be different at pitcher, or you could try an unorthodox stacking scheme. If you’re going with a contrarian stack, then it pays off to go with the best pitcher options. For more information refer to my article: How to Win at DFS (coming in the next few days). 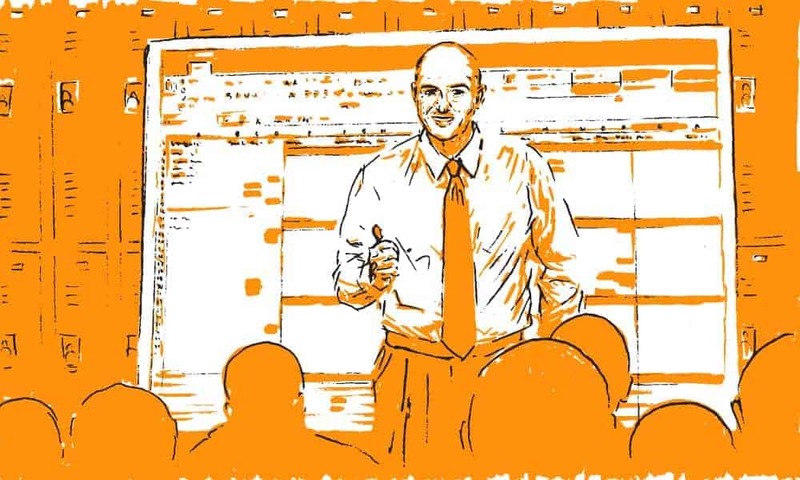 Conquering the low stakes is all about mastering the fundamentals: having a system for accurately judging player potential, factoring in projected ownership, and applying stacking strategies correctly. To move up in stakes you must adjust to the sharper field as chalky plays have the potential to be overowned, while volatile sleepers may go overlooked. Good luck in the upcoming season! Do you have any rule of thumb regarding how much of your salary you need to spend before you are satisfied that you’ve spent “all” of it? There is a point where you’ll have to choose whether or not you want a player with a higher letter grade or want to spend the extra $300 of salary you have before you hit the cap. Which is better in that situation? Something simple like “most value while spending X% of your salary” would be nice. 🙂 Thanks! It’s a bit of a balancing act. I’m personally OK with eating up to $1000 of salary. I also wouldn’t break up a stack just to spend a couple hundred extra dollars. When building a single entry lineup with high ownership expected for a stack is it wise to have that plus a contrarian stack or just go full contrarian? Good day, when setting your lines do you start first by selecting your pitcher and build around him or do you set positions first and fit him in? I have a habit (not sure if it’s good or bad) to select my pitcher first then build around him . please share your thoughts if it even matters.. Thanks!